Below are the steps to configure your Watchguard Network appliance for Weave phones and service. *Note - We have had frequent issues with the Watchguard OS. This device is not one of our recommended network firewalls. 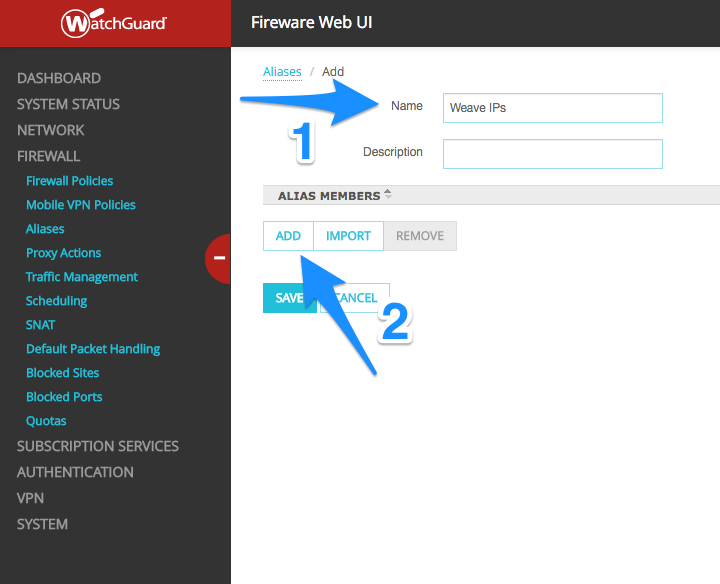 Make sure that the Watchguard firewall has the latest firmware version applied to it. Some older firmware versions do not have the ability to add the FQDN aliases without it we are unable to optimize the device for Weave traffic. Change the text in the Policy Name box at the top of the page from "Any" to "Weave Traffic"
***Important Note: If the button at the bottom of the screen says, "Disable Policy Auto-Order Mode", you must first click this button to enable manual ordering.